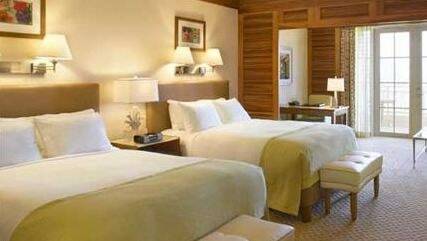 Fairmont Hotels & Resorts is a world-renowned chain of luxury accommodations. In Miami Beach, the Fairmont Turnberry Isle Hotel offers tranquil seclusion that’s reminiscent of the Mediterranean coast. The hotel’s 300 tropical acres include gorgeous golf courses, a private beach with white sand, an exclusive spa, and other premium perks. The Fairmont Turnberry Isle is an ideal getaway for groups of any size, from romantic honeymooners to serious convention-goers. The hideaway is routinely listed among the world’s top luxury hotels. Rooms at the Fairmont consistently receive top reviews; in 2009, Zagat’s rated the rooms as “Best in the South.” The hotel’s 392 rooms were recently renovated, so the property’s old-world Mediterranean design is enhanced with modern amenities. Basic rooms are tastefully decorated with muted green and brown textiles and natural wood furniture. Natural light pours in from the balconies, which overlook expertly landscaped grounds. Baths feature oversized tubs, glass-enclosed showers, and flat screen plasma TVs. The one-bedroom Jasmine Suite includes an oversized bedroom with a king-sized bed, plus a living room with a convertible queen-sized Murphy bed. The suite includes a marble master bathroom, an extra bathroom with shower, and a walk-in closet. The balcony provides views of a golf course. The Tower Suite is the Fairmont Turnberry’s most luxurious and private accommodation. This style of suite includes a foyer, a marble or wood floor, a large living room, a king-sized bedroom, a dressing room, and two closets. The master bathroom has a whirlpool and a color television, and the private balcony overlooks manicured grounds. The Fairmont Turnberry Hotel’s Presidential Suite is especially ideal for entertaining. Marble flooring runs throughout the suite. A large living room has two sofas and ample dining room for eight. Three stools are placed at the bar. French doors lead to a private balcony with views of the golf course. The bathroom includes a large soaking tub, a television, two sinks, and a two-line phone. The largest suite at Fairmont’s is the Grand Presidential Suite. Decorated with deep woods and white wool area rugs, this stunning suite is reminiscent of an island retreat. The impressive entryway includes a foyer and powder room. The dining room, which seats six, leads into a study and the bedroom. The master bath has a large soaking tub, a dual-line phone, two basins, and a color TV. The Grand Presidental Suite also includes a fully-equipped kitchen, a fireplace, a balcony with panoramic views, and a CD stereo system. Other amenities in every room include cotton robes, makeup mirrors, luxury skin care products, and high speed internet access. Connecting rooms are also available. 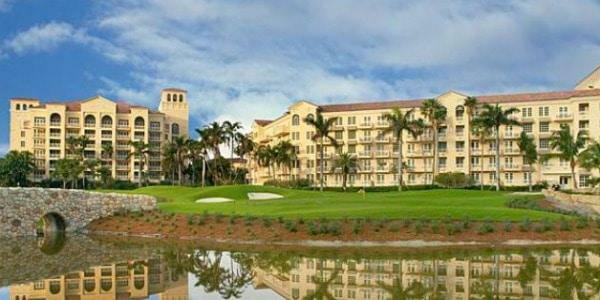 Turnberry Isle offers a virtually self-sustainable community for its guests. For recreation, amenities include a scenic three-mile jogging path, two on-site golf courses, a 25,000 square foot fitness center, and a tennis center with four clay courts. The Laguna Pool entertains children and playful adults with a lazy river, slides, and waterfalls. Poolside cabanas are available for lounging. The hotel also offers a number of restaurants. For instance, Bourbon Steak is an award-winning Michael Mina restaurant. Casual dining is also offered, and guests can choose to dine indoors or al fresco. Room service is also available 24 hours a day. Some other in-house attractions include a private club, a beauty salon, boutiques, wedding consulting, and an exotic herb garden.